One thing that particularly struck me about Mexico, was the efficiency and capability of the flush on their toilets. Not once was I disappointed, indeed not once even having to resort to the dreaded second flush, despite the best I could throw at it. Instead of the simple plunge technique in operation in England, Mexican toilets seem to employ a swirl technique which is quite superb. I think we really have a lot to learn from them. 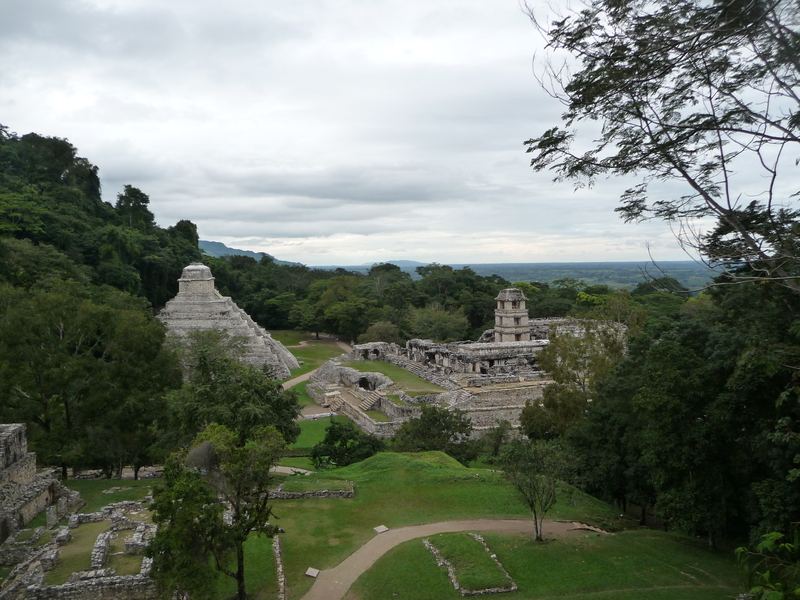 For I have now passed (if you’ll excuse the phrase) on from Mexico and into the breathtakingly beautiful Guatemala! And starting every entry as I do at the end, I shall return to San Cristobal where I was headed when I last left you. San Cristobal was a great town! Very high up (about the same as Mexico City, roughly 2300m), and when I got off the bus – shock, horror – RAIN. And it was actually bloody freezing too. Well, typical English weather at least, but a shock when acclimatised to sweltering heat as I was in Puerto. Mexican roads are sadly nothing like their toilets, and are possibly the least conducive roads to sleeping I have ever encountered. They could have learnt a thing or two from the Romans, as barely 100m seems to pass without a sheer bend or adverse change in gradient; as such, you are flung from side to side and up and down in a relentless barrage. And then, if you’re lucky enough to hit a stretch or straight road, you think “ooh some shut-eye awaits”, but no. You face the dreaded topes, or speed bumps. As the roads pass through a lot of little villages (though that’s being generous, it’s more like a couple of buildings by the road), to slow the traffic down there’s 2km blocks of topes every 200m, and they are HUGE. I digress. I mention the roads to say that on my 13 hour trip from Puerto I got next to no sleep, and so spent a lot of the first day in San Cristobal in bed. The next day, however, was very exciting! 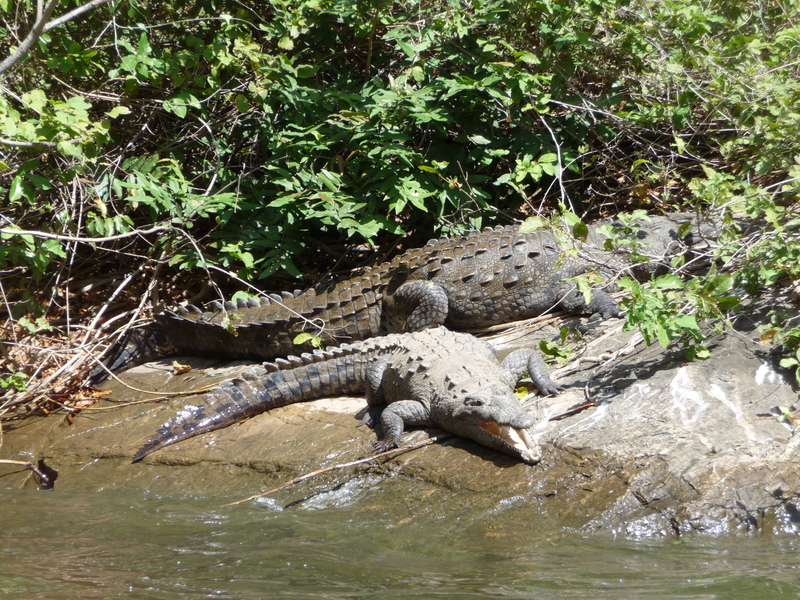 I went down the Sumidero Canyon, and saw crocodiles! ‘Twas very exciting, although they mostly just sat there soaking up the sun. They were indeed so motionless that I wondered at one point whether they were models put out for the tourists, but no! they did indeed move and slunk away into the river. Our guide was being very helpful and explaining everything (I am sure) in español, so I understood little of it. There were also some vultures. Due to the conditions in San Cristobal, and general cloudiness of the day, my face took a right battering from the sun, and I looked a fool afterwards. The next day was a n early rise. 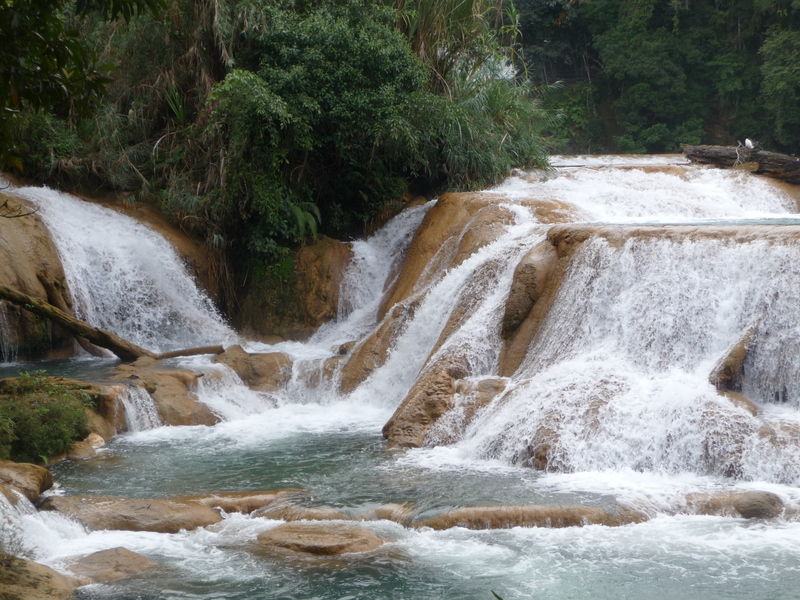 A 6 o’clock start and we went to see some breathtaking water cascades at Agua Azul, a breathtaking waterfall at Misol-ha, and some ruins in the middle of the jungle at Palenque. 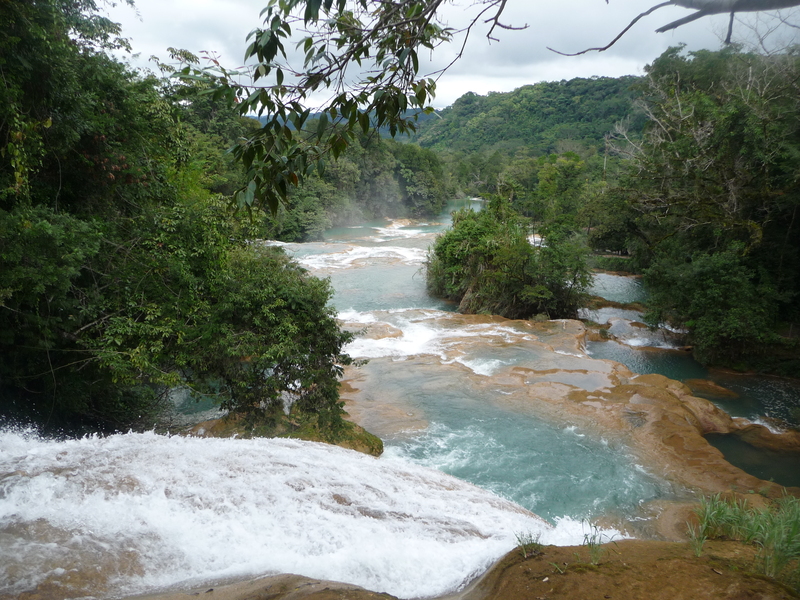 It was on the way back from Palenque that I encountered the first bad experience of the trip. Bearing in mind it was a 4hr return from Palenque to San Cristo, some locals had blockaded the road some 20km from home and weren’t letting any tourist vehicles through. So all the tour minibuses and coaches were in a backlog, and were held up for over an hour. Thinking the road was clear again, we headed off, but alas turned down what would it would be optimistic to call a dirt track. The sight of a 20-or-so-long convoy heading down this farmers lane was quite hilarious. And it didn’t end there! Having struggled down this track for nigh on 20 minutes, the people at the fro nt encountered a problem (apparently they’d gone the wrong way somewhere), and everyone had to turn around and go back the way we’d just come! Picture minibuses (but thankfully not the coaches for some reason, don’t know what happened to them) and trucks trying to do a 3 point turn down a dust track in the dark and you have the scene. After a lot of stop-start and driver arguments (and having to push our minibus up a hill it had stalled upon) we did finally make it back to some kind of road, and returned back to San Cristo about 2 and a half hours late (half 11). Jumping straight into bed, I was awoken at 7 the next morning by the manager of the hostel saying there was another minibus waiting to take me to Guatemala. “No there bloody well isn’t” would have been my reply if I knew the Spanish, but indeed there was. It seems that when I was out the day before, I’d received an email saying I’d been booked onto this bus, and that it was waiting for me. I thought “not bloody likely”, shouted mañana, mañana! (tomorrow, tomorrow!) and it went off without me. 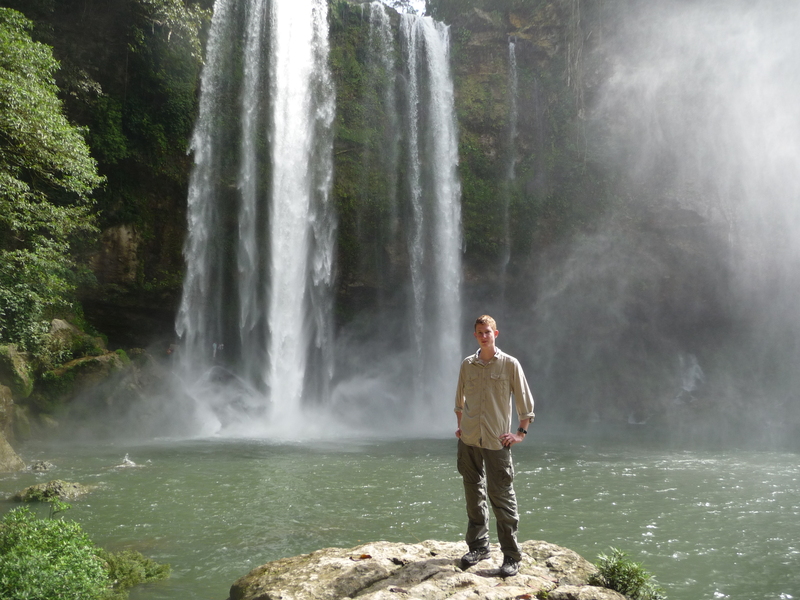 And so I had a relaxing final day in San Cristo, and headed off for Guatemala the next morning. I shall tell more about that later, save that it is astonishingly beautiful wherever you look. I am in Panajachel on the side of Lago de Atitlan, a lake surrounded by mountains and volcanoes on all sides.